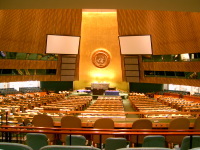 What to conclude from Bush's "stealthy use of the UN"
With President Bush yesterday addressing the United Nations General Assembly for the last time as President, Stephen Schlesinger this week wrote a counterintuitive article for the Los Angeles Times. "The U.S. quickly sought and won the backing of the U.N. Security Council for retaliatory moves against Al Qaeda and its Taliban hosts in Afghanistan. Bush hastily appointed an American ambassador to the U.N. and paid up back dues. Subsequently, the U.N. helped set up Afghanistan's new government, assisted in writing its constitution and oversaw its first democratic elections. "Through this period, the administration continued to trash-talk the institution, even while working with it. In 2003, there was a serious run-in when the U.S. (and a coalition of allies) unilaterally invaded Iraq without Security Council authorization -- yet even this sharp violation of the U.N. Charter did not end Bush's engagement with the U.N. Instead, finding himself isolated in Iraq, Bush swiftly pivoted back to the U.N. to win its support for the American occupation. In the aftermath of the invasion, the U.N. oversaw two elections in Iraq, helped craft its new constitution and supervised its referendum on the accord. "Since 2003, apparently sobered by its foreign policy adventurism, Washington has displayed a pragmatic realism in its relationship with the U.N. In 2004, it got U.N. peacekeepers to replace U.S. troops in Haiti; in 2005, it guided a resolution through the council that ultimately led to the expulsion of Syrian troops from Lebanon; in 2006, after a number of delays, it forged a cease-fire in the Israeli-Hezbollah conflict and arranged for U.N. forces to enforce the settlement; in late 2006, it persuaded the U.N. to impose sanctions on North Korea for its nuclear testing. From 2006-08, at the urging of the United States, the Security Council slapped three rounds of sanctions on Iran for its surreptitious uranium enrichment activities. "Washington has, in addition, pushed for expanded U.N. peacekeeping missions and worked to augment anti-AIDS measures, among other endeavors. "During his tenure, Bush carefully sidestepped efforts by members of his own party to oust Secretary-General Kofi Annan. He blocked congressional bills cutting further funding to the U.N. He allowed the United States to rejoin UNESCO. His daughter even interned at UNICEF, and his wife today serves as an honorary ambassador for the U.N. Literacy Decade through UNESCO." There is a broad consensus between America and most other leading nations on many issues. This can easily be forgotten when it is obscured by more acrimonious and higher profile disagreements between members of the UN Security Council, as over Kosovo in 1999 and Iraq in 2003. The degree to which American cooperation and involvement with the United Nations has continued in over the last eight years suggests the limited scope for solving current global problems and crises with still greater American involvement. The United Nations itself, to the degree to which it has been "President Bush's most important partner in the conduct of his foreign policy over the last eight years", deserves its share of the blame for that policy usually directed only at Bush and at America. In our briefing on the United Nations, we examine the notion that the body is a plausible or desirable alternative to American global leadership. On Notable Arguments, today we highlight Kim Holmes' column describing the competing visions for America's role in the world. Holmes sets out a choice "between a nation that safeguards and advances the cause of liberty" and "an America whose leadership always defers to international bodies, including the whims of the United Nations and the European Union". Unsurprisingly, Holmes prefers the former vision and so do we. Critiques of the particular choices America makes in foreign policy can be made without calling into question her right to take action against foreign threats. But sometimes the two are made together, as a case for a form of quasi- or actual global governance - with international institutions dictating policy to nations, rather than existing to support their diplomatic and other needs. Kim Holmes' description of a future in which "the UN could block a raid we want to conduct to destroy a terrorist camp that launched another brutal attack on America" or "the Secretary of State could be hauled up before a European court to answer charges of 'war crimes' in Iraq" is compelling. Its account of how military action to safeguard America and her allies could be prevented, and how democratic leaders could even face criminal charges for unpopular foreign policies, highlights the potential dangers of this notion of global governance both for global security and for liberty. Even as things are now, it is often the case that the terrorist who orders the deaths of democratic leaders goes on to be hailed one day as a courageous freedom fighter, and sometimes be awarded the Nobel Peace Prize. Ironically, some advocates of international justice seem less interested in putting this right than in ensuring that a President who ordered the bombing of such a terrorist leader could one day face a war crimes tribunal. Such a vision is not to be prefered to American global leadership. In our briefing on Global Governance, we set out some of the problems with the notion that America can or should be displaced by international institutions.